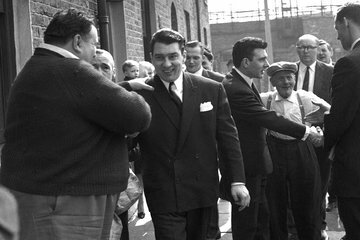 Discover the true story behind notorious East London gangsters, Ronnie and Reggie Kray, on this 2-hour walking tour. Exploring areas such as Whitechapel and Bethnal Green with a local guide means you’ll gain insight into the history and heritage of east London. Visit sites made famous by the violent antics of the brothers and pass The Blind Beggar pub, where the Kray’s infamously killed a rival gang. Small-group tour, limited to 15 people. Greet your guide and small group at Whitechapel tube station, located in the heart of East London. As you begin strolling, delve into the depraved underworld of 1960s London — an area ruled by the notorious Kray brothers. From your local guide, you’ll learn about countless police attempts to bring the brothers to justice and visit night clubs and pubs in which murders and shoot outs occurred. Explore Bethnal Green and Whitechapel — now fashionable areas of London — and be captivated by the violent reign of Ronnie and Reggie Kray. Please note, the tour only operates Friday to Sunday. Jamie our tour guide was friendly, relaxed and knowledgeable about the Kray Twins. Tested our knowledge on the twins and told us a few things we didn't know which obviously kept it interesting. Also told us some other interesting stories along the way round. John was very informative. Certainly knew his stuff. The tour was very interesting. Well worth going on if you are interested in the Krays and their culture. Our guide John was incredibly knowledgable , friendly and happy to take as many questions as we liked. Good tour, unfortunately it started to rain.